Kerry Drager is a pro photographer and author based in the California coastal town of Cambria. He enjoys sharing his enthusiasm for photography through teaching and writing. Known for his friendly and engaging teaching style, he has extensive experience in online education, in-person classes and seminars, and field workshops. He is an online instructor at the Bryan Peterson School of Photography and a "brick-and-mortar" instructor at Cuesta College's Community Programs. 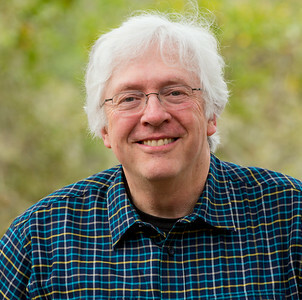 He is the author/photographer of Scenic Photography 101 and the co-author of two books – The BetterPhoto Guide to Creative Digital Photography and The BetterPhoto Guide to Photographing Light – all published by Amphoto/Random House. His picture book - Coastal Visions - was published in 2017. In addition, he is the co-author of three more titles: the photo-essay book The Golden Dream: California from Gold Rush to Statehood, the coffee-table book California Desert, and the photo book Portrait of California. His work has also appeared in national magazines, Hallmark cards, Sierra Club calendars, an American Express advertising campaign, and in the books BetterPhoto Basics and Daybreak 2000. Kerry has been profiled in Outdoor Photographer and Shutterbug magazines, as well as in the book The Photographer's Market Guide to Building Your Photography Business. Also see the interview with Kerry by Exhibitions Without Walls, an international organization for photographers and digital artists. Lastly, check out his Facebook page, where he regularly posts coastal images, complete with shooting insights, tips and techniques. Lenses: Nikkor 20mm f/2.8 D. Nikkor 50mm f/1.8 D. Micro Nikkor 105mm/2.8G ED VR. Nikkor 70-300mm G ED VR. Nikkor 18-300mm G ED VR (DX). Tripods: Sturdy main tripod: carbon-fiber Manfrotto 055CXPRO3 legs with Arca Swiss Monoball (B1) head. Lightweight go-everywhere tripod: Manfrotto 3001BD legs with Really Right Stuff BH-25 mini-ballhead. Both tripods: I also have attached a Really Right Stuff L-plate to my camera for ease in switching from horizontal to vertical format. Filters: Nikon NC clear protective filter for all lenses. Nikon Circular Polarizer II. Galen Rowell's graduated ND (Singh-Ray brand) both hard- and soft-edged types. 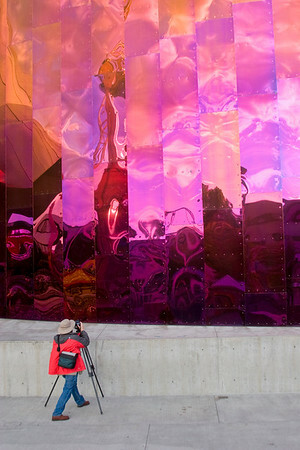 Photo at left: Kerry is shown while photographing the unique EMP building in Seattle, WA. Photo by Jim Miotke.